FAQ | Ephraim Tabornal DDS, Allison Tran DDS, Island in the Hills Dentistry, Inc.
We accept most major insurances as long as you are not assigned to a specific doctor (i.e. we don’t accept HMO insurances). Rest assured, our highly trained front office team members will assist you with any insurance matters prior to beginning treatment. Does your office provide payment plans? We do our best to offer payment options based on your needs. We accept cash, checks, Debit cards, and most major credit cards. We also offer flexible payment plans through Care Credit. We certainly do! Simply call our office and we will try to accomodate you at your convenience. Please feel free to call us if you have any question about your insurance coverage prior to your first visit. What is involved during my first visit? You will be greeted by our friendly front office personnel . 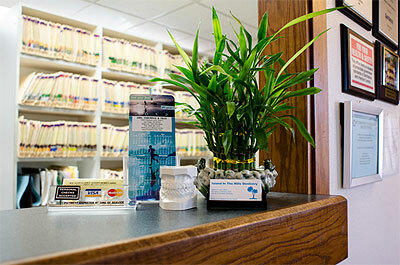 If you have dental insurance, you will be given any important information regarding your coverage. Dr. Tabornal or Tran will meet you as soon as you are seated. We will then thoroughly review your medical and dental history. We will then discuss any specific concern that you may have pertaining to your teeth, gums, and oral health, including any cosmetic concerns. We will proceed to perform a comprehensive oral exam of your teeth, soft and hard tissues (i.e. gums, mucosa, bone level) including oral cancer screening and TMJ. All findings will be discussed with you in detail. We make it a point to educate all our patients in order for them to understand their diagnosis and all aspects of their treatment. In most cases, we will then proceed with a thorough cleaning and polishing of your teeth. If further treatment is required, our front office team member will then review your treatment plan and fees. For majority of our patients, we recommend exams and professional cleanings every 6 months. What if I have an emergency and need to be seen as soon as possible? Call us as soon as possible. We’ll make every effort to accommodate you that day. Call our office number (858) 560-8250. Leave a message on our answering service stating an “emergency”. We will then get back with you ASAP. Pending on your condition, we may call in necessary medication. We will make every effort to schedule you an early appointment on the next business day. Do you see children? When should I bring my children in for their first dental visit? Absolutely! We recommend any child’s first dental visit at one (1) year of age. This first visit will allow your child to get acquainted with our office and prepare him/her for comfortable visits in the future. NOTE: Prior to age 1, if you notice anything unusual with your child’s teeth or mouth, do not hesistate to give us a call for an evaluation. I am looking to check the cost on a particular treatment. Can I get a quote over the phone before seeing the doctor? Normally, we require you to have a “problem-focused” exam (i.e. simple office visit for a specific problem) prior to giving any treatment fee. This is because we need to correctly diagnose your concern and that we offer a wide array of services and options to rectify the issue. I don’t like seeing a dentist. What does your office provide for me to be comfortable? First and foremost, we emphasize what we call “TLC”: meaning our personal attention to you and thoroughly understanding your needs. We also provide sedation ( nitrous oxide), noise-cancelling headphones for music listening, and TV in every room. My teeth are crooked in the front, but I don’t want braces. Are there any other options? For most patients, porcelain veneers are the best option for those not wanting braces. They are a faster alternative, taking 2-4 appointments versus 2-4 years with braces. Veneers are commonly termed “instant orthodontics”, meaning instant straightening of teeth that appear crooked, crowded or overlapping. Many Hollywood celebrities have this procedure performed.